Can Too Much Time Online Make You Depressed? : Shots - Health News A new study shows a rise in depression and stress among young people parallels the growth in smartphone and social media use. During the era that social media and smartphones has risen, depression and stress among young people has also risen. The study findings suggest a generational shift says psychologist Jean Twenge, with San Diego State University who headed the study and is author of the book iGen. To see a significant increase in negative psychological states "among our vulnerable population of teens and young adults is absolutely heartbreaking," she says. Twenge and her colleagues analyzed data from the National Survey on Drug Use and Health, a government survey that tracks mental health and substance use in individuals age 12 and over in the U.S. They looked at survey responses from more than 200,000 adolescents ages 12 to 17 and almost 400,000 young adults ages 18 and over between 2005 and 2017. They found the rate of individuals reporting symptoms consistent with major depression over the past year increased 52 percent in teens and 63 percent in young adults over a decade. Girls were more vulnerable than boys. By 2017 one out of every five teenage girls had experienced major depression in the last year. Rates of psychological distress, which Twenge describes as "feeling nervous, hopeless or that everything in life is an effort" rose by 71 percent among people aged 18 to 25. Suicidal thoughts, plans and attempts also increased. Death from suicide increased by 56 percent among 18- to 19-year-olds between 2008 and 2017. Understanding exactly why these trends are on the rise is always a challenge, says Twenge, since researchers can only point out correlations, not causes. But, she says, since the trends are "pretty large in a fairly short period of time, that helps us narrow what the likely cause might be." She thinks the rise in smartphone and social media use is a significant factor. By 2012, smartphones had become widespread, she says, and it's around that same time that social media began to dominate young people's lives. For example, in 2009 about half of high school seniors visited social media sites every day. That's climbed to about 85 percent today, with Instagram and Snapchat replacing Facebook as the main "go to social media site," she says. It's not just the phone or social media itself, says Twenge. It's the amount of time teens and young adults spend with it. As Twenge found in earlier research, the more time they spend, the greater the risk of depressive symptoms. Twenge says it's known from a body of research that in-person social contact is good for mental health. She questions whether spending that same amount of time on Instagram and Snapchat is just as beneficial, and says "it seems clear the answer is 'No.' "
"Spending time on social media tends not to be in real time," she says. "You're not having a real time conversation with someone — usually you're not seeing their face and you can't give them a hug; it's just not as emotionally fulfilling as seeing someone in person." The findings of the new study ring "completely true" for clinical child psychologist Mary Fristad with the Department of Psychiatry and Behavioral Health at The Ohio State University, who was not involved in the study. Fristad, who treats children from age 10 through to college age, says her patients are concerned "not about how much fun they look forward to having over the weekend, but about what event can they post on Snapchat so that other people will know they have friends." Fristad says kids are developmentally more worried about peer status and approval during pre-teen and teenage years. Social media exaggerates that process, she says, because it's so public, available, and highly visual. It's like "taking what happens in typical adolescent development and putting it on steroids," she says. For example, as opposed to "going to school with 'meh' hair suddenly there's a picture of you with 'meh' hair. Everybody's going to see it, can comment on it, make fun of you," she says. These experiences resonate enormously during adolescence and can deeply affect teen's confidence and sense of self. 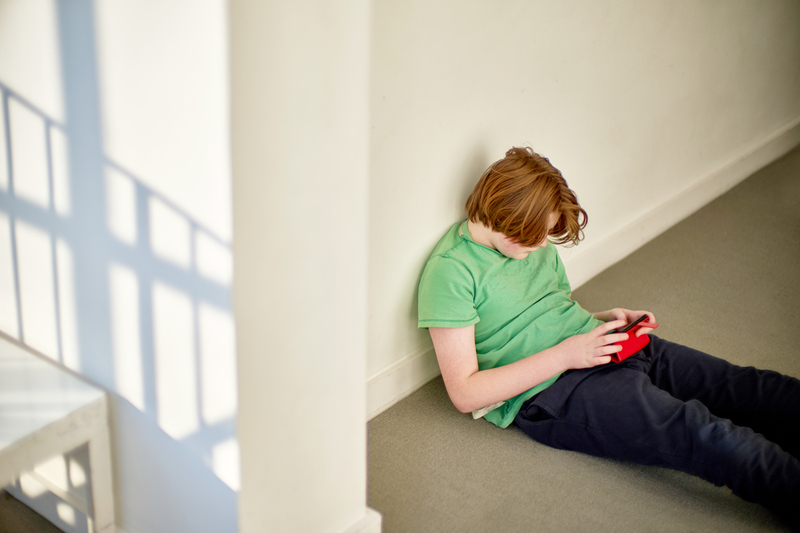 Other researchers are less convinced of the connection between screen time and mood. It's important to keep in mind that while there has been an increase in negative psychological states, the majority of teens and young people are not depressed, notes Robert Croesner, a researcher in adolescent health and the chair of the Sociology Department at the University of Texas at Austin, who was not involved with the research. And he adds, there could be many other things besides technology contributing to the rise. "There really aren't data that show a strong connection between these two things," he says. "I think this increase in mental health issues is real and is something we need to be concerned about, but until we know exactly what's causing it, I don't think it's so easy for us to put the blame on any one thing." Croesner says, to explain the phenomenon, you have to look at the entire context of the historic moment we're living in. "I think we are living in a time of great uncertainty, where people are unsure about the future of the country but also their own futures," he says. "And that is anxiety provoking for anybody but it's especially true for young people whose whole future is ahead of them." In the past economic pressures have been linked to increases in depression but Twenge notes that since 2012 the economy has been improving so a failing economy is not likely to blame. Another explanation could simply be that these teens and young adults are more willing to admit they are stressed, anxious, worried and even depressed and that they need, and want help. Psychologist Andrew Przybylski, an experimental psychologist at the University of Oxford in Oxford, England, is skeptical of the study findings. "The data is entirely descriptive," he wrote in an e-mail. "I find it very unfortunate that there is undue speculation about the effects of technology." He said the rise in mental health issues could be explained by other factors such as the opioid crisis. Still Fristad thinks the impact of social media on mental health is a real issue for this age group. Fristad organized a focus group of college students at Ohio State. The students had all received smartphones when they were 13 or 14. What they told her was was in line with current study's findings. The students described "another realm of things to worry about, pressure to build your brand, sharing too much and making unrealistic comparisons to other kids ... being constantly on the phone and not engaging in face-to-face interactions." "There's just a lot of heightened tension around this," says Fristad. And the advice from her college students for younger kids? "Phones Off, Friends On." Researcher and clinical psychologist Steve Ilardi, with the University of Kansas tries to help anxious and depressed kids feel better. The good news, he says, is that it's clear that they "intuitively grasp that how we live now is not ideal for us." Teens get that spending hours surfing, bringing their phones to bed, "this relentless cascade of stressful notifications and images is not good for them and they get it." Ilardi developed a treatment approach, based in part on cognitive behavioral therapy, that helps young people make lifestyle changes, focusing on better diet and nutrition, exercise, exposure to sunlight and getting a good night's sleep, all of which have been shown to reduce depressive symptoms. "Kids buy into it," says Ilardi, "when you lay it out for them and explain they can be empowered to make changes themselves that can make a big difference in how you feel, how your brain, mind and body functions." He says behavior change can "help kids get unstuck from their perpetual sense of anxiety, stress and depression."